Physical evaluations: Are you fit-for-duty? This is the second post in our two-part series on pre-employment testing in Trinidad’s US division. It’s no secret that working on a drilling rig involves labour-intensive work – often performed in extreme conditions. That’s why new rig hands have to be deemed “fit-for-duty” before they head out to the field to ensure they can handle the physical and mental requirements of their assigned job. To be rig-ready, they need to pass both a drug and alcohol test, and a physical evaluation. With a solid grip on Trinidad’s zero-tolerance stance on substance abuse and testing procedures, it’s time to get physical! Read on as HR Supervisor, Amanda Vaught, takes us through physical evaluations in our US division. “It takes physical strength and stamina, mental toughness, and a good attitude to cut it on the rigs,” explained Vaught. That’s why it’s so important for our team to ensure rig hands can safely handle the work before they start; not only for their safety, but for the safety of those around them. We had each position on a drilling rig evaluated onsite by a physical therapist to develop a set of rig-specific physical demands. The pre-employment physical evaluation is closely aligned with these predetermined demands. The two to three hour evaluations vary by repetitions and by weight, based on the position and matching physical demands analysis. A driller, for example, will only be tested for a 25 to 50 pound carry over short distance with less repetitions than a floorhand. Evaluations also consist of climbing, squatting and endurance testing. Where do the evaluations take place? Vaught and her team of crew coordinators have preferred providers located all over the United States to ensure our employees are tested consistently and in accordance with the physical demands of their position. Trinidad operates in Canada, Mexico, Saudi Arabia and the US, but no matter where in the world we’re drilling, we’re committed to keeping our team safe. Mandatory pre-employment substance abuse testing and physical evaluations are one of the ways we’re making sure that happens. Curious to learn more about the physical requirements of each of the positions on a drilling rig? 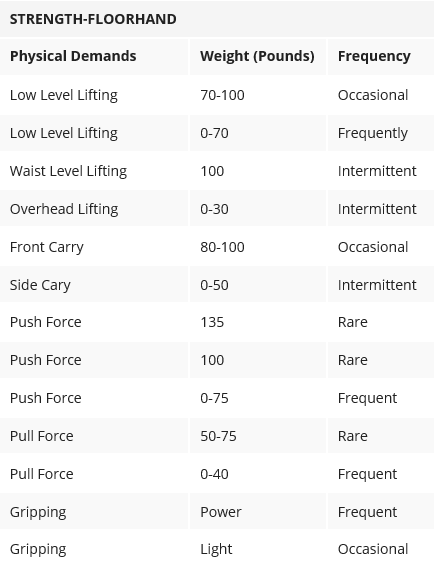 Check out the Physical Demands Analysis on our website.